As many of you know, in August of 2012 my life changed forever as my 13 year old daughter Summer was diagnosed with Leukemia. Just 4 short months later she died on December 22 at 10:55 pm. She was a beautiful person inside and out and in the last three years we have tried to make sure that people remembered her vibrant personality while helping others through our experience. Summer was an 8th grader at FCMS that loved basketball, track, and wanted to be a chef. Many people have donated in Summer’s memory to Wigs for Kids individually and by participating in organized fundraisers. Wigs for Kids is an organization that provides FREE wigs to children suffering from hair loss. Dealing with an illness as a child can be frightening on so many levels, but having to deal with body changes is one area where kids can feel like they have some control. 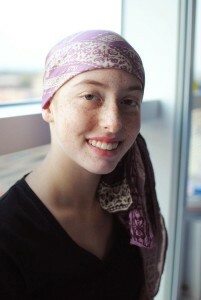 Summer had amazing red, curly hair and she was determined to try to be as normal as possible during treatment, so getting a wig was high on her list. Custom wigs can cost thousands of dollars, and with medical bills it can often be difficult for families to make a purchase like this a priority. It can also be difficult to get to a stylist to have measurements and fittings done. Working with Wigs for Kids changed our lives, and the life of our stylist that donated her time and visited UVA on multiple trips to make sure Summer’s wig would fit perfectly. It is often hard to find a non-profit that truly impacts lives during an illness, and so we have been blessed to know that every dollar that we have donated to Wigs for Kids has helped a child feel better and taken a large financial burden off the parents. To most of us, our hair is a very large part of our identity, and children are no different. This year I wanted to find a way to raise more money, but with three teenagers and a full time job it was difficult to come up with ideas until I realized I could combine my professional occupation with my fundraising goals. 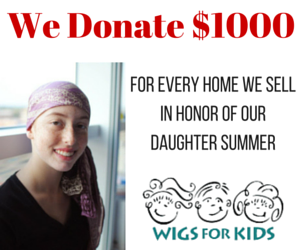 For every home we sell this year the Dream Weaver Team will be donating up to $1000 to Wigs for Kids. You can help us by referring anyone you know that is looking to move to our team to help them. We work with buyers and sellers all over Winchester, Lake Holiday and Leesburg VA and can even help your friends and family members across the country by referring them to someone on our national team. You can of course also make direct donations to Wigs for Kids, including hair donations!